Chevrolet scored a winner when it revealed the 2016 Chevrolet Silverado Realtree Bone Collector concept at the 2015 SEMA Show. For 2016, it’s bringing another Silverado in the same vein. 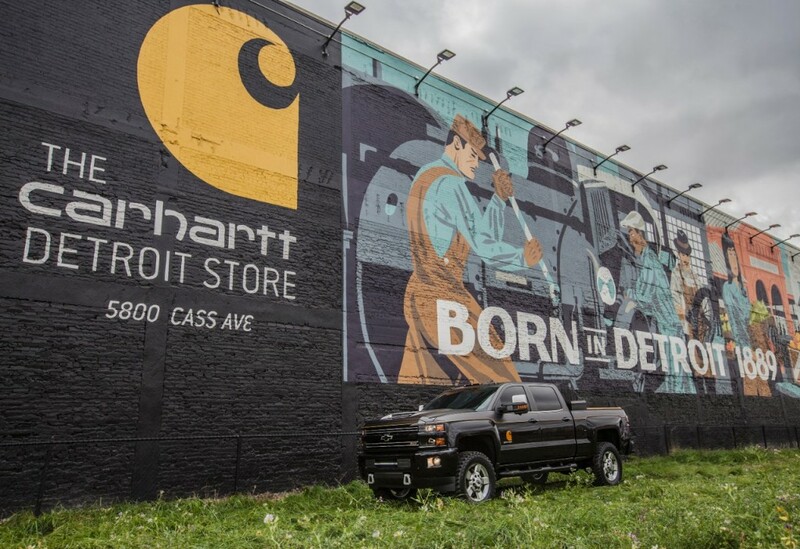 The 2017 Chevrolet Silverado 2500 HD Carhartt concept brings in the durability of Chevy trucks and the hardworking, long-lasting mentality that has surrounded Carhartt for decades. When Chevrolet approached Carhartt about the topic of a concept vehicle, both brands stated it become clear the ideals were very similar. Signature Carhartt material and style is present throughout the interior of the 2017 Silverado 2500 HD. The cabin begins life in Jet Black but features Carhartt’s signature duck brown garment material on the seats, armrests and door panel inserts, with triple-stitched seams just like the jackets. The Carhartt logo is also laser-etched on the headrests. Finally, antique nickel trim offers just the right amount of contrast to the cabin on the doors, center console and instrument panel. Carhartt material can be found on the exterior, too. Chevrolet tapped the work clothing maker for tough fabric to encompass the tonneau cover. A Carhartt gold pinstripe graphic subtly announces the concept’s inspiration along both sides of the truck, while similar antique nickel accents can be found on the grille, 20-inch wheels, mirror caps and tow rings. Look for the 2017 Chevrolet Silverado 2500 HD Carhartt concept to make its debut on November 1, 2016, at the SEMA Show in Las Vegas. I used to look forward to what Chevrolet would come up with for SEMA. High performance concepts, skunkworks hotrods, and powertrain swaps were common. It seems those days are gone in favor of appearance packages and corporate crossover packages that highlight electrical outlets in the bed. The most performance seems to be CAI and exhaust packages. It seems like this is another one of those years, but I hold out slight hope of something more interesting. There is very little design risk going on with GM trucks. GM is taking the backseat to the competition.